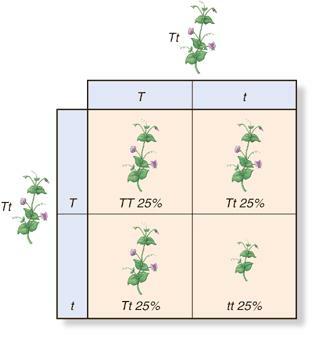 Variation within a population is a critical and required component for natural selection. If you have understood all the work on DNA, chromosomes and Mendelian genetics, you should now have a good understanding of where the genetic causes of this variation comes from. But remember that variation can also be caused by the environment. Indeed all variations in reality come from an interplay between genetic and environmental factors. Genes by themselves cannot cause variation as without the environment of a cell to produce the protein, genes alone cannot affect the phenotype. Sexual reproduction is the key to genetic variation in a population. Meiosis produces gametes that are haploid and genetically different from each other. The gametes may have a different combination of randomly “shuffled” chromosomes. Crossing over in meiosis also allows alleles that would not otherwise be combined in a gamete. So there are massive genetic differences between one gamete and the next. And then there is random fertilisation so that any one male gamete is equally likely to fuse with any female gamete. Random fertilisation (of gametes that meiosis has made genetically different to each other) is the key to genetic variation in a population. A final cause of genetic variation has nothing to do with sexual reproduction and is mutation. DNA replication is not 100% accurate – the enzymes in eukaryotes make one error every billion base-pairs. These mutations are random and can lead to new alleles appearing in a population. 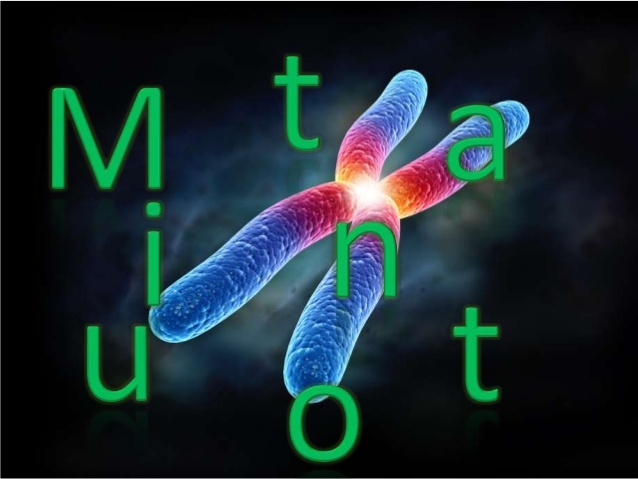 Chromosomal mutations can also occur where chromosomes do not separate properly in meiosis or parts of a chromosome break off and re-join somewhere else…. Some of the differences seen in populations are due not to differences in genes but due to the differing environments in which an organism lives. Peas which have inherited two copies of the T allele (for tallness) will never grow tall unless they are planted in well-watered soil and given access to sunlight. You would never be a school teacher as a career without understanding that the environment a brain develops in can affect a person’s outcomes. Environment is as important as genes in many variations in the human population, in particular to do with health and disease. This is why so much emphasis for health for example is placed on promoting balanced diets, altering smoking habits, and moderating alcohol consumption. Don’t allow yourself to fall into the lazy thinking of the “nature-nurture” debate. It is lazy thinking because the debate is a nonsense. Nothing is either determined by your genes or your environment – it is always both. So when you read of a ‘gene for obesity’ or a ‘gene for domestic violence’ treat with extreme caution (and switch newspapers……) If you read that playing violent computer games causes violent behaviour in humans, treat with caution. None of these variations in a population will be just due to genes, none will be just do to the environment. It will always be some complex interaction between the two. Just doing the pGLO practical this morning with my Y12 group and came across a great photo of a fly that has been genetically modified to express a gene from a species of Arctic jellyfish. 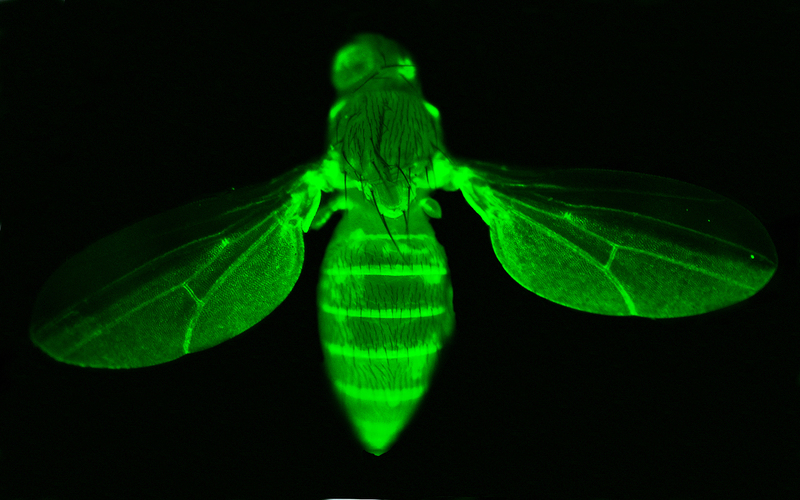 The fly now makes a protein called GFP that causes it to flouresce green. There are one or two things which make a biology teacher’s (and indeed an exam marker’s) blood pressure rise. Well in fact in my case there are many dozens of things, as some of you know, but let’s keep it to the things candidates write in genetics answers in exams. This post is an attempt to encourage you to avoid the commonest “howler”. The dominant allele does not have to be the more common one in a population. Just because an allele is dominant, it does not mean it will be the most common in a population. I often hear answers in which people think that in a population 3/4 of the population will have the dominant phenotype, 1/4 will be recessive. This is utter nonsense of course. The ratio of 3:1 only applies to the probabilities of offspring produced by mating two heterozygous individuals. There is a gene in humans in which a mutation can cause polydactyly: this rare condition results in babies born with an extra digit on each hand. Anne Boleyn was a famous sufferer in the past. But the allele of the gene that causes polydactyly is dominant – it is a P allele. I would imagine everyone reading this post, (all 12 of you…..), will probably have the genotype pp. The p allele that causes a normal hand to form is very very common in our population whereas the P allele is very very rare. Don’t ever believe that just because an allele is common, it must be dominant. Few things in life are certain, famously just death and taxes. Northampton Town flirting with relegation can perhaps be added to this list. But you can be pretty certain that tucked away somewhere in your iGCSE Biology exam there will be a genetics question that asks you to draw a genetic diagram. There are usually four or even five marks available and so learning how to ensure you get all these marks is vital in your quest for an A* grade. GCSE candidates are terrible at doing genetic diagrams: they fill the space with messy scribbles, doodles, strange tables and lines and then confidently write 3:1 at the bottom… Not a recipe for success. So learn how to do it, be neat, take your time and you can guarantee full marks. If the question doesn’t do it for you, you should start by defining what the letters you will use for the alleles. If one allele is dominant over the other, it is conventional to use the upper case letter for the dominant allele, the lower case letter for the recessive one. It will tell you in the question which allele is dominant. Start your genetic diagram by writing the phenotype of the parents in the cross. Underneath the phenotype, write the genotype of the parents. Next show random fertilisation. I think it is much better to draw a Punnett square that has the male gametes down one side, the female gametes down the other and then carefully pair them up. This is a stage where mistakes can be made if you rush so however simple you think this process is, take your time….. Follow these rules and you will always score full marks – happy days…….. This will be my final blog entry from Dubai. I will be flying home tomorrow with spirits refreshed by this amazing country and the positive and dynamic people I have met. There will be a Mendelian genetics question in one of the two EdExcel IGCSE Biology papers. Examiners are people who like to stick to tried and tested formulae with setting questions and it’s always worked in the past, so why change now…? What is the difference in meaning between a gene and an allele? Why does the genotype of a person, plant, fruit fly or rabbit contain two alleles for each gene? What is different about the genotype of a gamete compared with every other cell in the body? Why are gametes different? How would you explain what is meant by a recessive allele? If two alleles are codominant, what does this mean? Give me a specific example in which this pattern of inheritance is found. In which case, all that remains is to remind you how to set out a genetic diagram. I am not usually a proponent of slavishly following protocols but in producing a genetic diagram in an exam, you certainly should. There are usually five marks available for a question like this and only one of the marks is for getting the right answer. 20% = E grade and that is not what we want. The next bit is the first tricky bit. Write the alleles present in the gametes. Remember gametes are formed by meiosis and so only contain one member of each homologous pair of chromosomes – they will only have one allele from each pair in each cell. Draw circles around each gamete to show the examiner you understand they are individual cells. Write out the offspring phenotypes underneath your list of offspring genotypes showing how they match up. If you do this you will always get all the marks. The ratio of 3:1 is only found in the offspring of two heterozygous parents. Sometimes students seem to think that all genetic crosses produce offspring in this ratio. This doesn’t make any sense if you think about it for a moment but in an exam, thinking for a moment is not always easy. Good luck and keep working hard! Comments welcome as always – it does show me that someone is reading this stuff…….